It doesn't matter if you're four or 40, everyone enjoys feeding the fish. And that popular tourist attraction will remain intact at Decorah's Fish Hatchery, thanks to the formation of a new group. Formed last year, the nonprofit Friends of the Decorah Fish Hatchery group recently began overseeing the coin-operated fish food dispensers, following an administrative request from the DNR. "We learned the sale of our fish feed (from the dispensers), which amounts to between $5,000 and $8,000 a year, was an accounting problem for the DNR in Des Moines," said Fish Hatchery Manager Brian Malaise. After the DNR suggested eliminating the feeders, the Friends group was organized to keep them in place. "Everyone realized it would be a disappointment for visitors. Everyone comes here to feed the fish," said Malaise. "So the Friends group was developed with the help of Paul Berland, projects director with Northeast Iowa Resource Conservation and Development (RC&D). Now the group purchases the feed and gets all the proceeds," said Malaise. Since its formation, the group has been working on ideas for what to do with the profits. Berland said the Board identified the first major project should be to build new restrooms. Next week it will launch a fund-raising campaign to build the universally accessible facility, which will include modern restrooms, educational opportunities and a gathering place for visitors. According to Malaise, it will be the first project of its kind in the state - one privately funded and then donated back to the DNR. "Everybody was on board and we realized this place was too special to just put up a square, concrete facility. We thought we should support the Hatchery's mission of education and enhancing enjoyment and make it an interpretive facility as well," said Berland. Malaise explained in addition to updated restrooms and an outdoor, covered gathering area, there will be self-guided kiosks in and around the 24-foot by 44-foot structure. "We're seeing more and more people who want to get married here. The public will be able to reserve the pavilion for events," said Malaise. 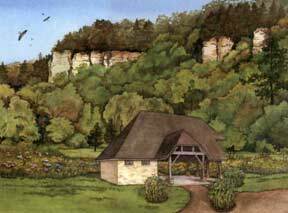 Berland added, "The interpretive center will hopefully have a large set of educational materials, which include the history of the hatchery, information about the natural resources that support the trout, watershed education, geology of the bluffs, the prairie and more." "We're hoping to eventually expand the educational component out into the prairie (adjoining the Fish Hatchery) in the form of a trail with signs." Malaise added there is another important function of the facility. "Education is the ultimate mission of the Friends group, but one of the other main issues is that we're inviting people to come because of our fishing accessibility, but there aren't facilities (restrooms) for folks with limited mobility," he said, adding the hatchery's current restroom facility is a 1930s pit toilet built by the Civilian Conservation Corps (CCC) in 1934. Malaise said while the current restroom is definitely primitive on the inside, the group is sensitive to the fact the new building should blend well with the other CCC architecture on site, including the existing restroom. "We've been working with Wild Rose Timberworks to both work the design into the landscape and to match the existing buildings," said Malaise. "Wild Rose has been meticulous in their matching with the current architecture." Berland added, "And the old facility will not be torn down." Berland explained the group is about halfway toward its goal of raising $250,000 for the project, thanks to several in-kind and cash donations. Last fall Berland helped secure an Iowa State Recreational Trails Grant for $75,000 and the Hatchery transferred a McElroy Grant for interpretive signs for $5,000. "We also had a middle school group raise 'Pennies for Potties.' In a three-week time period, they generated about $1,000. They are challenging anyone in the community to match their donation," said Malaise. Malaise explained Friends is hoping to raise enough money to develop an endowment fund to maintain the facility as well as to provide revolving exhibits. "We're also working with volunteers, such as the Decorah Garden Club, to help us develop landscaping and maintain it," he said. Malaise said the new facility is needed more than ever due to increasing popularity of the Fish Hatchery and trout fishing in Northeast Iowa. "Trout fishing is a $200 to $400 million industry in Northeast Iowa," said Malaise, adding the Hatchery seems to be becoming an "unofficial trail head" for the new Trout Run Trail. "We anticipate the number of people coming to the Hatchery will continue to increase as the trail progresses," he said, adding the Hatchery provides tours to anywhere from 1,000 to 2,000 students a year. "It's a great place to bring kids." Berland added, "Plus the bald eagles also attract a lot of people." The Friends of Decorah Hatchery is hosting a fundraising event Saturday, Aug. 5, beginning at 5 p.m. The event is free to attend and will feature a concert by the group Big Blue Sky, free Moo-Mobile shakes and free popcorn. There will also be fly-tying demonstrations, children's fly-casting contests, fish races and free fish food available for feeding the fish. Attendees are welcome to bring a picnic-style meal to eat and their own beverages and are encouraged to bring a blanket or lawn chairs for seating. An informational presentation will begin at 7:30 p.m. The Board hopes to begin construction of the facility next summer and have it completed by fall. Anyone wishing to make a tax-deductible donation to the project can visit www.decorahfishhatchery.org or call 563-382-8324. For more information, contact one of the following Board members: Randy Iverson, Karl Jacobson, Peggy Beatty, Paul Berland and Tom Murray.